Property 10: Very popular, cosy property with uniqur views. 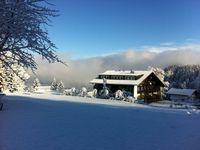 Property 12: Deluxe and cosy chalet in friendly farm village. Beautiful detached holiday home in Balderschwang in the Allgäu. 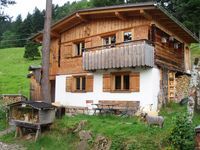 Property 20: Beautiful detached holiday home in Balderschwang in the Allgäu. Amazing chalet to chill and relax! Fantastic place to chill winter or summer, we went in the winter and were blown away with the place. Hedi was excellent at helping us, fyi in winter it is about a 20 minute walk to the place up a hill and down a hill. Not terribly hard, but to be noted, as you will need to sled your stuff to the house, my mother (78) did the trip with us no problem. For us it was great and part of the fun and experience. Hedi provides sleds to use for this and to keep at the house for kids to play with. Also she left us snow shoes for hiking in. Things to note: New bathroom and toilet with hot water, works excellent with great pressure etc. Kitchen has no running water, just outside is running fresh water you get with bottle for use for drinking etc, very easy. All beds are bunk beds but rather comfortable with towels, blankets and pillows provided. Plenty of wood provided already cut for fireplace. Kitchen has electric cooker plus a traditional wood fire stove and fridge. Dog friendly. If you want somewhere to chill, go skiing, snow shoeing etc this is the place. Just amazing. We will go back in summer for sure for hiking. The location was beautiful, with pretty places to walk on small gravel roads and a small ski hill across the street. We were allowed to use the large industrial kitchen to make meals, which was fantastic. There were holiday decorations galore that made for a festive feeling on Christmas and everything was really clean, high quality and nice inside. There were a few surprises that may have been due to language barriers or to limited info on the description page: we didn't realize that we were essentially renting one level of the hotel, there were other people living in the building upstairs and campers were allowed access to the lower level where the showers were located. This was fine as nobody interrupted our family time, but it did make me nervous because we had nine young children and were not exactly a quiet group. There were a lot of fees that I wasn't aware of, but this may have been my mistake interpreting the website: taxes, bedding fees, towel fees, per person fees, etc. Breakfast was fine but was pretty expensive for what was provided (particularly for young children) and I wish that we had brought our own meats, cheeses, rolls and yogurts. Finally, be warned if you have lots of young children as there are lots of decorations everywhere. Our kids did pretty well but broke an angel when they bumped a table. Obviously we were happy to pay for that, but we were also charged for a soap dispenser that broke when my mom depressed the handle and for a stack of plates that were pushed off the table by a window that blew open on the first night of our stay. We are certain we did not try to open that window but were charged nonetheless. Thankfully our German friend had insurance that could cover such things. In any case, the owners, family and staff were very helpful and kind in their interactions with us and they shared warm gluhwein with us on Christmas eve and invited us to participate in a community candle-lit walk to the local church to listen to Christmas songs. All in all it was a wonderful experience and a great place to bring 19 family members to for Christmas!